The Canon Digital Rebel T1i (500D) is proving to be an excellent field camera. In my first test, I roamed the streets of San Francisco with a Canon 70-200 mm f/4 L zoom. 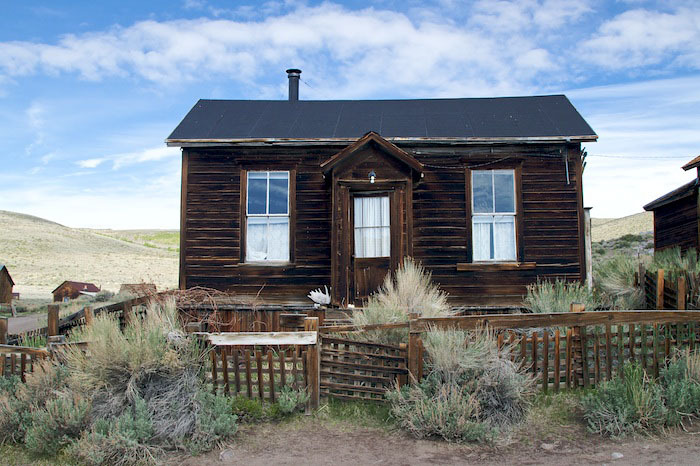 For my next adventure, I visited Bodie State Park off of Hwy. 395 in Northern California. Since CA may be closing most of its State Parks due to the budget crisis, I wanted to visit Bodie again for what I hope isn't a last look. This time, I mounted one of my favorite zooms on the T1i, the 24-105mm f/4 L IS. I used a rotating polarizer for most of the outdoor shots, that were captured early to mid morning. ISO was generally set to 200, which works great on the T1i and gives me a little more exposure latitude. Even though battery life is quite good on the T1i, I did use the BG-E5 Battery Grip ($114) for this trip. It allows me to load two LP-E5 batteries or 6 AA cells. I recommend going the LP-E5 route because it feels lighter in that configuration. As I stated in the first test, this DSLR is great in the field. It feels good in the hands, is light on the shoulder, records excellent images, and I have my entire inventory of Canon lenses at my disposal. You can see a catalog of 12 images from this shoot by visiting the Canon T1i Visits Bodie State Park photo set on Flickr. All of the images were captured with the T1i and the 24-105mm zoom. I've been recording video primarily in the 720p mode (1280 x 720) on the T1i. It's a nice fit for publishing HD on YouTube, plus I get the full 30 fps capture. One major difference with the T1i compared to movie making with the 5D Mark II, is that I don't have an external mic jack on the T1i. I get a lot of ambient sound in addition to the subject I'm recording. But the video itself is terrific. I highly recommend using an IS lens for video recording, or you'll be disappointed with the results. I consider the Canon T1i capable of serious field work, especially when you want to travel light. I carried a small bag that had 3 lenses (18-55 mm IS, 24-105mm IS, and the 70-200 f/4), the T1i, battery grip, polarizer, and extra memory. The bag was light and I was able to capture everything I wanted, the way I wanted, using this rig. There are two major pitfalls with the Canon T1i in the field that you should be aware of. First, this is not a weather proof camera and will not stand up to harsh elements the way the Canon pro models will. So you have to protect the body when things get stormy. Also, as I mentioned before, there isn't an external mic jack for video capture. So your audio options are pretty limited. Speaking of video, be sure to have a large capacity Class 6 SDHC memory card. Personally, I like the Sandisk SDSDX3-008G-A31 8GB Extreme III SDHC card for $56. It's tough, fast, and dependable for field work. So, a couple cards like this, an extra battery, and a few light lenses, and you can handle just about any challenge in the field with this camera. I've had good experiences with a Transcend 16Gb Class 6 SDHC card which I use for RAW shooting and video on my D90. No issues of any kind. I bought it in February 2009 for $31 at newegg, but the best price at a reputable dealer I see it for now is $40 at amazon -- still a great deal. General note: consumers shouldn't look down on all brands that aren't Sandisk or Lexar. There are very few SD manufacturing plants and most of the brands are made by the same handful of plants, and brands like Transcend or Kingston work perfectly fine for most people. HD video recording is nice but it don't has an external mic jack. I think that your blog isvery good, very interesting . I found it on . I will back often. I think that your blog isvery good, very interesting . I found it on . I will be, check back often. I think that your blog is . I found it on Google, Bing, MSN. I will back often.